Legislative leaders in all 50 states have been asked to send delegates to Indianapolis for a second discussion on the state-led process for crafting amendments to the U.S. Constitution, and to begin shaping the rules and procedures a Convention of the States that would follow. Long said he’s heard the calls for fast action on an Article V convention, but is confident the careful, thoughtful approach being taken by The Mount Vernon Assembly is the best way to ensure Congress authorizes a Convention of the States and that any proposed constitutional amendments are seen as legitimate. A bipartisan group of lawmakers from 33 states initially met in December at George Washington’s Mount Vernon estate in Virginia to see if there was sufficient support to move forward with planning for a Convention of the States. “We need something to change and this is, I think, the only way it’s going to happen – the states are going to have to take charge,” Long said. Mike Monetta, 37, drove from Boston with a colleague and spent more than 10 hours Thursday in the House gallery waiting for the lower chamber to vote on the Senate-passed resolution, which – as lawmakers race to wrap things up before the end of the biennium – was taken up at the end of a marathon floor session. He was back in the gallery Friday morning to see Vermont’s resolution get final approval from the House. Monetta is the organizing director for Wolf PAC, which he described as a political action committee to end all political action committees. “We exist for only one purpose and that’s to get a 28th amendment to get all money out of politics,” he explained. The Left wants to limit the scope of the First Amendment freedom of speech guarantees, while conservatives want to limit government. Which do you suppose will better stand up to debate? (Excerpt) – By the fifth article of the plan, the Congress will be obliged “on the application of the legislatures of two thirds of the States [which at present amount to nine], to call a convention for proposing amendments, which shall be valid, to all intents and purposes, as part of the Constitution, when ratified by the legislatures of three fourths of the States, or by conventions in three fourths thereof.” The words of this article are peremptory. The Congress “shall call a convention.” Nothing in this particular is left to the discretion of that body. And of consequence, all the declamation about the disinclination to a change vanishes in air. Nor however difficult it may be supposed to unite two thirds or three fourths of the State legislatures, in amendments which may affect local interests, can there be any room to apprehend any such difficulty in a union on points which are merely relative to the general liberty or security of the people. We may safely rely on the disposition of the State legislatures to erect barriers against the encroachments of the national authority. Article V of the U.S. Constitution provides two ways of amending the nation’s fundamental charter. Congress, by a two-thirds vote of both houses, may propose amendments to the states for ratification, a procedure used for all 27 current amendments. 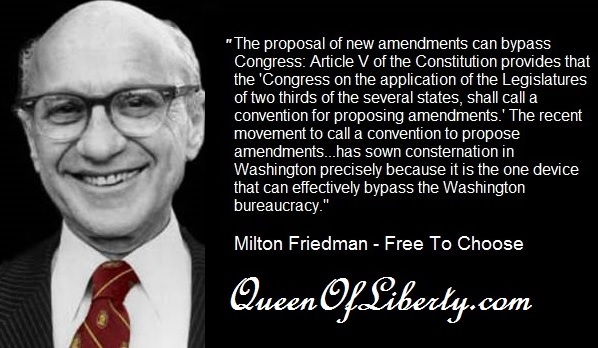 Alternatively, if the legislatures of two-thirds of the states apply, 34 at present, Congress “shall call a Convention for proposing Amendments…” This alternative, known as an Article V Convention, has yet to be implemented. This report examines the Article V Convention, focusing on contemporary issues for Congress. CRS Report R42592, The Article V Convention for Pro posing Constitutional Amendments: Historical Perspectives for Congress examines the procedure’s constitutional origins and history and provides an analysis of related state procedures. Significant developments in this issue have occurred recently: in March 2014, the Georgia Legislature applied for a convention to consider a balanced federal budget amendment, revoking its rescission of an earlier application; in April 2014, Tennessee took similar action. While both applications are valid, they may revive questions as to the constitutionality of rescissions of state applications for an Article V Convention and whether convention applications are valid indefinitely. Either issue could have an impact on the prospects for a convention. In other recent actions, the legislatures of Ohio, in November 2013, and Michigan, in March 2014, applied to Congress for an Article V Convention to consider a balanced federal budget amendment; these are the first new state applications since 1982 and are also the 33rd and 34th applications for the balanced budget amendment convention. If all 32 previous related state applications are valid, it is arguable that the constitutional requirement for requests from two-thirds of the states has been met, and that Congress should consider calling a convention. Internet- and social media-driven public policy campaigns have also embraced the Article V Convention as an alternative to perceived policy deadlock at the federal level. In 2011, the “Conference on a Constitutional Convention,” drew participants ranging from conservative libertarians to progressives together to discuss and promote a convention. In December 2013, a meeting of state legislators advocated a convention, while the “Convention of States” called for a convention to offer amendments to “impose fiscal restraints and limit the power of the federal government.” Also in 2013, the advocacy group Compact for America proposed the “Compact for a Balanced Budget,” an interstate compact that would provide a “turn-key” application, by which, with a single vote, states could join the compact; call for a convention; agree to its format, membership, and duration; adopt and propose a specific balanced budget amendment; and prospectively commit themselves to ratify the amendment. Congress would face a range of questions if an Article V Convention seemed likely, including the following. What constitutes a legitimate state application? Does Congress have discretion as to whether it must call a convention? What vehicle does it use to call a convention? Could a convention consider any issue, or must it be limited to a specific issue? Could a “runaway convention propose amendments outside its mandate? Could Congress choose not to propose a convention-approved amendment to the states? What role would Congress have in defining a convention, including issues such as rules of procedure and voting, number and apportionment of delegates, funding and duration, service by Members of Congress, and other questions. Under these circumstances, Congress could consult a range of information resources in fashioning its response. These include the record of the founders’ original intent, scholarly works cited in this report and elsewhere, historical examples and pr ecedents, and relevant hearings, reports, and bills produced by Congress from the 1970s through the 1990s. Michigan’s Republican-led Legislature may have inadvertently made history last month when it adopted a resolution urging a convention of the states for the purpose of drafting a balanced budget amendment to the U.S. Constitution. Article V requires Congress to authorize a convention when 34 states have called for an amendment on the same topic, but that threshold has never been reached. Conventional wisdom suggests – and supporters repeatedly stated – that by adopting its resolution, Michigan had joined more than 20 other states with similar applications. But Michigan may unknowingly have been the 34th state to call for a federal balanced budget amendment, according to at least one constitutional scholar. A California Congressman is asking U.S. House Speaker John Boehner to consider the argument and explore whether a convention should be called. The dispute hinges on an apparently untested legal question: Can a state rescind an application after petitioning Congress? “There is a school of thought – scholars are very divided on the subject – that once a state Legislature has said ‘yes’ to an Article V Convention, it is without the ability to then turn around and change it’s mind and say, ‘No, we don’t want that any more,” said Gregory Watson, a constitutional expert who works as a staffer in the Texas House. Watson, best known for spearheading ratification of the 27th Amendment some 200 years after it was proposed, believes that Michigan became the 22nd state with a clearly active application calling for a convention and balanced budget amendment. By his tally, 12 other states applied decades ago before they later changed their minds, but he’s not sure they had the authority to do so. Michigan’s resolution made national headlines last week, with The Washington Times and Fox News reporting on the prospect of a constitutional convention and questions over how many states have active applications. Citing published reports, U.S. Rep. Duncan Hunter (R-California) sent a letter to Boehner suggesting that the House “should lead an effort to ascertain whether 34 states have voted affirmatively” for a convention and asking the speaker to direct appropriate entities to make that determination. Still, even some supporters are skeptical. Rob Natelson, a constitutional scholar and former law professor, told The Washington Times that states have always had the ability to rescind applications and does not think Michigan’s resolution is the 34th of its kind. “I think it’s unlikely that a request for Congress to call a convention at this point would get anywhere,” said Natelson, who wrote an Article V handbook for state lawmakers published by the American Legislative Exchange Council (ALEC), a conservative organization that supports the push for a balanced budget amendment. State Sen. Mike Green (R-Mayville) said he was aware that there was some sort of dispute over the status of old applications when he introduced the balanced budget resolution in Michigan’s upper chamber last year, but he was surprised to learn that Congressman Hunter raised the issue with Boehner in D.C.
“The latest count that I was getting back from the group of legislators that I’ve been working with is that we were going to be number 23,” Green said Wednesday. The issue may very well end up in federal courts, Green acknowledged, but he would prefer that other states sign on soon so that there is no question over active convention applications. Any proposed resolution would have to be ratified by 38 states. If all this sounds hypothetical, that’s because it is at this point. An Article V Convention has never been called, and it’s not even clear whether Congress or states or delegates would set the rules. The nation’s last constitutional convention was its first, as the founding fathers drafted the document now under dispute. Despite those unknowns, supporters say states must act and force the federal government to stop what they believe is a reckless and now-annual pattern of deficit spending. Michigan Joint Resolution V, like those adopted by several other states, calls for an amendment limiting federal appropriations to estimated revenues in each fiscal year, allowing exceptions only in the case of a national emergency. Critics argue that a balanced budget amendment would limit the federal government’s ability to respond to fiscal crises or make strategic investments, and some have suggested the process could devolve into a “runaway convention” ruled more by public pressure, lobbyists and outside influences than sound policy. “Government would become more beholden to artificial spending limits that would all but ensure that the shutdown of the federal government we just saw last month would become an all too-common occurrence,” State Sen. Bert Johnson (D-Detroit) said in November during an early floor debate on the resolution. The resolution passed the Michigan House with some bipartisan support, but the Senate vote split directly down party lines, with all Democrats voting against it. Republican Gov. Rick Snyder endorsed the push for a federal balanced budget amendment in his January State of the State address but the joint resolution did not require his signature for adoption. Advocates of a “living” Constitution argue that the Founders’ Constitution is hopelessly outdated and unable to grow and adapt to the times. The amendment procedure detailed in Article V belies such claims. As Madison explains in The Federalist, the amendment procedure allows subsequent generations to correct errors and make whatever “useful alterations will be suggested by experience.” Yet at the same time, the difficulty of constitutional amendment prevents the Constitution from being deprived “of that veneration, which time bestows on everything, and without which the wisest and freest governments would not possess the requisite stability.” By design, the amendment process requires extensive deliberation and ensures that amendments are the settled opinion of the American people. To date, as was expected, every amendment to the Constitution has been proposed through Congress before being ratified by the states. Although there have been several attempts to call an Article V amending convention – some of which have driven Congress to act – the extensive unknowns and significant risks involved in that uncharted option make congressional proposal of amendments abundantly more prudent and the most viable method to achieve serious constitutional reform. This essay is adapted from The Heritage Guide to the Constitution for a new series providing constitutional guidance for lawmakers. The process of amendment developed with the emergence of written constitutions that established popular government. The charters granted by William Penn in 1682 and 1683 provided for amending, as did eight of the state constitutions in effect in 1787. Three state constitutions provided for amendment through the legislature, and the other five gave the power to specially elected conventions. no means of change, but assumes to be fixed and unalterable, must, after a while, become wholly unsuited to the circumstances of the nation; and it will either degenerate into a despotism, or by the pressure of its inequalities bring on a revolution… The great principle to be sought is to make the changes practicable, but not too easy; to secure due deliberation, and caution; and to follow experience, rather than to open a way for experiments, suggested by mere speculation or theory. In its final form, Article V creates two ways to propose amendments to the Constitution: through Congress or by a special convention called by the states for the purpose of proposing amendments. In either case, the proposed amendment or amendments must then be ratified by the states, either (as determined by Congress) by state legislatures or by ratifying conventions in the states. The Virginia Plan introduced at the start of the Constitutional Convention called for amendment “whensoever it shall seem necessary.” The Committee of Detail proposed a process whereby Congress would call for a constitutional convention on the request of two-thirds of the state legislatures. George Mason feared this method was insufficient to protect the states, while Alexander Hamilton thought that Congress should be able to propose amendments independent of the states. Madison (as recorded in his Notes of Debates in the Federal Convention of 1787) thought the vagueness of an amendment convention sufficiently problematic to reject the provision: “How was a Convention to be formed? By what rule decide? What the force of its acts?” After further debate, the delegates passed language proposed by Madison (and seconded by Alexander Hamilton) that the national legislature shall propose amendments when two-thirds of each House deems it necessary, or on the application of two-thirds of the state legislatures. Proposed amendments were to be ratified by three-fourths of the states in their legislatures or by state convention. The Constitutional Convention made two specific exceptions to the Amendments Clause, concerning the slave trade (Article V, Clause 2) and equal state suffrage in the Senate (Article V, Clause 2), but defeated a motion to prevent amendments that affected internal police powers in the states. The careful consideration of the amending power demonstrates that the Framers would have been astonished by more recent theories claiming the right of the Supreme Court to superintend a “living” or “evolving” Constitution outside of the amendment process. More significantly, the double supermajority requirements – two-thirds of both Houses of Congress and three-quarters of the states – create extensive deliberation and stability in the amendment process and restrain factions and special interests. It helps keep the Constitution as a “constitution,” and not an assemblage of legislative enactments. Most importantly, it also roots the amending process in the Founders’ unique concept of structural federalism based on the dual sovereignty of the state and national governments. The advantage of the Amendments Clause was immediately apparent. The lack of a bill of rights – the Convention had considered and rejected this option – became a rallying cry during the ratification debate. Partly to head off an attempt to call for another general convention or an open-ended amendments convention, but mostly to legitimize the Constitution among patriots who were Anti-Federalists, the advocates of the Constitution (led by Madison) agreed to add amendments in the first session of Congress. North Carolina and Rhode Island acceded to the Constitution, and further disagreements were cabined within the constitutional structure. Madison had wanted the amendments that became the Bill of Rights to be interwoven into the relevant sections of the Constitution. More for stylistic rather than substantive reasons, though, Congress proposed (and set the precedent for) amendments appended separately at the end of the document. Some have argued that this method makes amendments more susceptible to an activist interpretation than they would be otherwise. As Madison predicted, the difficulties inherent in an Article V amendments convention have prevented its use, though some state applications (depending on how those applications are written and counted, an additional controversy in the Article V convention process) have come within one or two states of the requisite two-thirds. Precisely because of the potential chaos of the process, the very threat of an amendments convention can be used to pressure Congress to act rather than risk an amendments convention. The movement favoring direct election of Senators was just one state away from an amending convention when Congress proposed the Seventeenth Amendment in 1911. Most recently, in the 1980s, state applications for a convention to propose a balanced budget amendment led Congress to vote on such an amendment and pass the Gramm-Rudman-Hollings Act (later declared unconstitutional in part by the Supreme Court) requiring the federal budget to be balanced. There have been hundreds of applications for an amending convention over the years from virtually every state. Because no amending convention has ever occurred, an important question is whether such a convention can be limited in scope, either to a particular proposal or within a particular subject. While most calls for amending conventions in the nineteenth century were general, the modern trend is to call (and thus count applications) for conventions limited to considering a single, specific amendment. Some scholars maintain that such attempts violate the very mechanism created by Article V: the text says that upon application of the states Congress “shall call a Convention for proposing Amendments,” not for confirming a particular amendment already written, approved, and proposed by state legislatures (which would effectively turn the convention for proposing amendments into a ratifying convention). Indeed, it is not at all clear as a matter of constitutional construction (and doubtful in principle) that the power of two-thirds of the states to issue applications for a convention restricts, supersedes, or overrides the power of all the states assembled in that convention to propose amendments to the Constitution. Other questions include the many practical aspects of how an amending convention would operate and whether any aspects of such a convention (including going beyond its instructions) would be subject to judicial review. The Federalist Papers, unfortunately, offer no guidance on this matter. Madison refers to amendment conventions in Federalist No. 43 only in general terms, noting that Article V “equally enables the general and the State governments to originate the amendment of errors.” And in Federalist No. 85, while Hamilton discusses how Congress cannot limit the scope of an Article V convention, he says nothing as to whether states can or cannot do so. The requirement that amendments proposed by such a convention must be ratified by three-fourths of the states is a significant limit on the process and likely prevents a true “runaway” convention from fundamentally altering the Constitution. Serious scholars will undoubtedly continue to debate the historical record and speculate about the possibility of an amendments convention under Article V. Nevertheless, the lack of precedent, extensive unknowns, and considerable risks of an Article V amendments convention should bring sober pause to advocates of legitimate constitutional reform contemplating this avenue. While a valid method created and available under the Constitution, “a Convention for proposing Amendments” has never been viewed as just another tool for reform but has become ever more so an ultimate option to be deployed only in extremis for the sake of maintaining the Constitution. Hence, the only time Madison pointed to an amendments convention was during the Nullification Crisis of 1832 as a last-ditch effort to prevent the wholly unacceptable and unconstitutional alternative of nullification and secession that then threatened the continued existence of the United States. Likewise, when Abraham Lincoln looked to constitutional reforms to resolve disputed questions in the midst of the Civil War, he noted that “under existing circumstances” the convention mode “seems preferable” precisely because it “allows amendments to originate with the people themselves, instead of only permitting them to take or reject propositions originated by others, not especially chosen for the purpose.” Yet when the immediate crisis was over, Lincoln strongly advocated what became the Thirteenth Amendment by congressional proposal and did not pursue an amending convention, despite the amendment’s initial failure in the House of Representatives. It should be noted that in both cases an amendments convention was understood to be free to propose whatever amendments thought necessary to address the problems at issue. Much greater certainty – not to mention extensive historical experience and proven political viability – exists as to the power of Congress to propose amendments. Since 1789, well over 5,000 bills proposing to amend the Constitution have been introduced in Congress; thirty-three amendments have been sent to the states for ratification. Of those sent to the states, two have been defeated, four are still pending, and twenty-seven have been ratified. Because of the national distribution of representation in Congress, most amendment proposals are defeated by a lack of general support and those amendments that are proposed to the states by Congress are generally likely to be ratified. In a challenge to the Eleventh Amendment, the Supreme Court waved aside the suggestion that amendments proposed by Congress must be submitted to the President according to the Presentment Clause (Article I, Section 7, Clause 2). Hollingsworth v. Virginia (1798). In the National Prohibition Cases (1920), the Court held that the “two-thirds of both Houses” requirement applies to a present quorum, not the total membership of each body. One year later, in Dillon v. Gloss (1921), the Court allowed Congress, when proposing an amendment, to set a reasonable time limit for ratification by the states. Since 1924, no amendment has been proposed without a ratification time limit, although the Twenty-seventh Amendment, proposed by Madison in the First Congress more than two hundred years ago, was finally ratified in 1992. Regardless of how an amendment is proposed, Article V gives Congress authority to direct the mode of ratification. United States v. Sprague (1931). Of the ratified amendments, all but the Twenty-first Amendment, which was ratified by state conventions, have been ratified by state legislatures. In Hawke v. Smith (1920), the Court struck down an attempt by Ohio to make that state’s ratification of constitutional amendments subject to a vote of the people, holding that where Article V gives authority to state legislatures, these bodies are exercising a federal function. Although some scholars have asserted that certain kinds of constitutional amendments might be “unconstitutional,” actual substantive challenges to amendments have so far been unsuccessful. National Prohibition Cases (1920); Leser v. Garnett (1922). The Supreme Court’s consideration of procedural challenges thus far does not extend beyond the 1939 decision of Coleman v. Miller, dealing with Kansas’s ratification of a child labor amendment. The Court split on whether state ratification disputes are nonjusticiable political questions, but then held that Congress, “in controlling the promulgation of the adoption of constitutional amendment[s],” should have final authority over ratification controversies. Click HERE to read the first chapter of Mark Levin’s newest book THE LIBERTY AMENDMENTS onlline. ………………Click on the image above to purchase Mark’s book. Click HERE to visit CONVENTIONOFSTATES.COM. Click HERE to visit THEPEOPLESCONVENTION.ORG. Click HERE to visit Mr. Callahan’s officiail campaign website. It is a condition of my admission to this great land that I am not allowed to foment the overthrow of the United States government. Oh, I signed it airily enough, but you’d be surprised, as the years go by, how often the urge to foment starts to rise in one’s gullet. Fortunately, at least as far as constitutional government goes, the president of the United States is doing a grand job of overthrowing it all by himself. On Thursday, he passed a new law at a press conference. George III never did that. But, having ordered America’s insurance companies to comply with Obamacare, the president announced that he is now ordering them not to comply with Obamacare. The legislative branch (as it’s still quaintly known) passed a law purporting to grandfather your existing health plan. The regulatory bureaucracy then interpreted the law so as to un-grandfather your health plan. So His Most Excellent Majesty has commanded that your health plan be de-un-grandfathered. That seems likely to work. The insurance industry had three years to prepare for the introduction of Obamacare. Now the King has given them six weeks to de-introduce Obamacare. “I wonder if he has the legal authority to do this,” mused former Vermont governor Howard Dean. But he’s obviously some kind of right-wing wacko. Later that day, anxious to help him out, Congress offered to “pass” a “law” allowing people to keep their health plans. The same president who had unilaterally commanded that people be allowed to keep their health plans indignantly threatened to veto any such law to that effect: It only counts if he does it — geddit? As his court eunuchs at the Associated Press obligingly put it: “Obama Will Allow Old Plans.” It’s Barry’s world; we just live in it. The reason for the benign Sovereign’s exercise of the Royal Prerogative is that millions of his subjects – or “folks,” as he prefers to call us, no fewer than 27 times during his press conference – have had their lives upended by Obamacare. Your traditional hard-core statist, surveying the mountain of human wreckage he has wrought, usually says, “Well, you can’t make an omelet without breaking a few eggs.” But Obama is the first to order that his omelet be unscrambled and the eggs put back in their original shells. Is this even doable? No. That’s the point. When it doesn’t work, he’ll be able to give another press conference blaming the insurance companies, or the state commissioners, or George W. Bush . . . The most telling line, the one that encapsulates the gulf between the boundless fantasies of the faculty-lounge utopian and the messiness of reality, was this: “What we’re also discovering is that insurance is complicated to buy.” Gee, thanks for sharing, genius. Maybe you should have thought of that before you governmentalized one-sixth of the economy. By “we,” the president means “I.” Out here in the ruder provinces of his decrepit realm, we “folks” are well aware of how complicated insurance is. What isn’t complicated in the Sultanate of Sclerosis? But, as with so many other things, Obama always gives the vague impression that routine features of humdrum human existence are entirely alien to him. Marie Antoinette, informed that the peasantry could no longer afford bread, is alleged to have responded, “Let them eat cake.” There is no evidence these words ever passed her lips, but certainly no one ever accused her of saying, “If you like your cake, you can keep your cake,” and then having to walk it back with “What we’re also discovering is that cake is complicated to buy.” That contribution to the annals of monarchical unworldliness had to await the reign of Queen Barry Antoinette, whose powdered wig seems to have slipped over his eyes. Had I been I informed, I wouldn’t be going out saying, “Boy, this is going to be great.” You know, I’m accused of a lot of things, but I don’t think I’m stupid enough to go around saying, “This is going to be like shopping on Amazon or Travelocity,” a week before the website opens, if I thought that it wasn’t going to work. Michael Beschloss is right: This is what it means to be smart in a neo-monarchical America. Obama spake, and it shall be so. And, if it turns out not to be so, why pick on him? He talks a good Royal Proclamation; why get hung up on details? Until October 1, Obama had never done anything – not run a gas station, or a doughnut stand – other than let himself be wafted onward and upward to the next do-nothing gig. Even in his first term, he didn’t really do: Starting with the 2009 trillion-dollar stimulus, he ran a money-no-object government that was all money and no objects; he spent and spent, and left no trace. Some things he massively expanded (food stamps, Social Security disability) and other things he massively diminished (effective foreign policy), but all were, so to speak, preexisting conditions. Obamacare is the first thing Obama has actually done, and, if you’re the person it’s being done to, it’s not pretty. The president promised to “fundamentally transform” America. Certainly, other men have succeeded in transforming settled, free societies: Pierre Trudeau did in Canada four decades ago, and so, in post-war Britain, did the less charismatic Clement Attlee. And, if you subscribe to their particular philosophy, their transformations were effected very efficiently. But Obama is an incompetent, so “fundamentally transformed” is a euphemism for “wrecked beyond repair.” As a socialist, he makes a good socialite. But on he staggers, with a wave of his scepter, delaying this, staying that, exempting the other, according to his regal whim and internal polling. The omniscient beneficent Sovereign will now graciously “allow” us “folks” to keep all those junk plans from bad-apple insurers. Yet even the wisest King cannot reign forever, and what will happen decades down the road were someone less benign – perhaps even (shudder) a Republican – to ascend the throne and wield these mighty powers? Nancy Pelosi described the Affordable Care Act (ACA) as something that “captures the spirit of our founders” and will “put money back in the pockets of America’s patients” (WSJ, House.gov). However, only 46% of Americans had a favorable view of the ACA when a Democrat-controlled Congress voted it into law. Since then, approval has decreased to 37%. According to Pew Research, less than 1/3 of Americans are happy with our nation’s education system. However, instead of promoting an overhaul of the system, which the public wants, the President and legislators send the message that they don’t care by enrolling their kids in elite private schools and cutting initiatives like the D.C. Opportunity Scholarship Program (CNS News). In his series of speeches on the economy this summer, President Obama insisted that “America has fought its way back” and has already “recovered” (LA Times). Yet, only 28% of the public feels that the U.S. economy is recovering. Democrats’ 2012 election platforms saw a larger embrace of pro-choice stances than we’ve ever seen before. Their TV ads were filled with pro-choice messaging, abortion rights activists were main speakers at the DNC, and the head of Planned Parenthood even introduced President Obama at a campaign rally (Politico). In the real world, more Americans feel that having an abortion is “morally wrong” than those who don’t. When George Zimmerman was deemed “not guilty” of the murder of Trayvon Martin, countless Democratic leaders echoed the President’s calls for an honest discussion on race. In fact, 62% of Democrats felt that the Zimmerman verdict raised issues about race than needed to be discussed, though only 36% of the total public agreed with them. In recent years, the Democratic party has been riddled with one scandal after another, from Benghazi to Weiner to the IRS. As a result, the public’s trust in government has plummeted since 2007 – it is now a measly 19%. Despite how “phony” Obama may believe the scandals to be, the American public definitely feels otherwise. Even a blind monkey with half a brain could tell you that there’s a disconnect between the current administration and the public. Just how big is this disconnect? Surprisingly massive. On the major issues that dominate interviews and debates each year, Democratic leaders are increasingly distancing themselves from the views of the majority of American people. The President is taking multi-million dollar vacations while regular Americans are decreasing their number of paid off days just to keep their jobs. Legislators are enrolling their children in elite private schools while the rest of us are volunteering personal time and money to help our local public school systems. The NSA is defending its right to access public phone records, though we are adamantly calling for it to stop.